Paramahansa Yogananda’s Collected Talks and Essays, which includes, Man’s Eternal Quest and The Divine Romance, present in-depth discussions of the sweeping range of inspiring and universal truths that have captivated millions in his Autobiography of a Yogi. Readers will find these talks alive with the unique blend of all-embracing wisdom, practical encouragement, and love for humanity that have made the author one of our era’s most revered and trusted guides to the spiritual life. 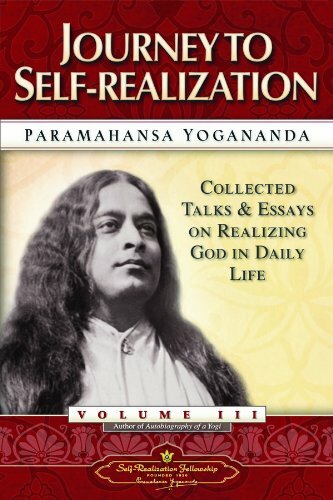 In this anthology, Journey to Self-Realization, Paramahansa Yogananda shows us how we can experience the Divine Presence within us and in all life – not just as a passing inspiration but as a constant inner realization. Through this expanded awareness, we receive the gifts of the soul: peace, divine love, ever new joy, intuitive guidance for every question and crossroads we encounter in the amazing adventure of human life. The True Signs of Progress in Meditation.